Unlike our bones or skin, our teeth do not have regenerative powers and cannot grow back together if broken or chipped. Every day we do things that potentially put our teeth in danger. Many of these practices are habits we have acquired over time even though our parents told us not to do them. The tables have turned and now it’s our turn to teach our children how and why to protect their teeth. While there are plenty of activities that are detrimental to our teeth we have come up with five we feel are the most popular offences. You’ve probably heard that saying from your mom growing up and like most things, she was right. Unless you’re using them to chew food or to help you speak properly, your teeth are not a tool and shouldn’t be treated like such. Often times when we’re in a rush or are too lazy to grab a pair of scissors we use our teeth to break tags off of new clothing, tear open a package or even twist a bottle cap off. Using your teeth as a tool is a threat to your dental health and can cause your teeth to crack. 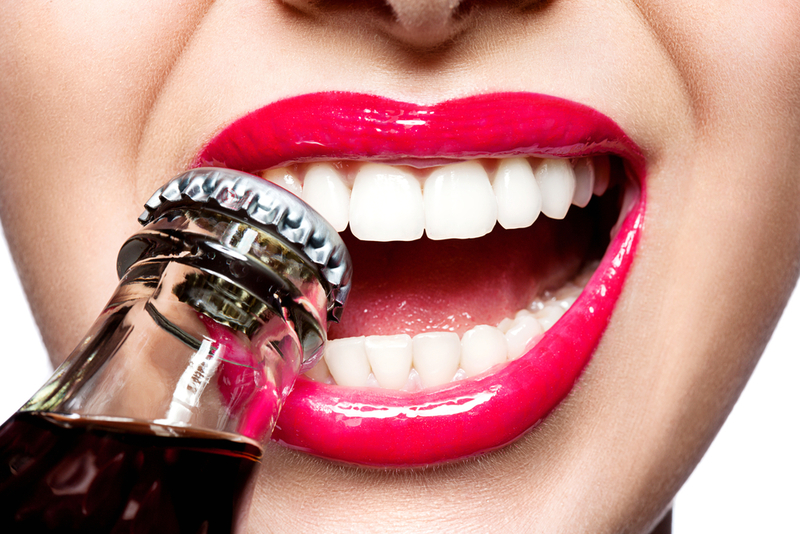 Grab the scissors (or bottle opener) next time – your teeth will thank you. While brushing your teeth twice a day is an essential part of proper oral hygiene, if you brush too hard you can cause more harm than good. Experts warn that brushing too hard can wear down enamel, irritate your gums, make your teeth sensitive, and even cause cavities. A good rule of thumb is the three-finger grip on your toothbrush – with your thumb underneath and two on top of the toothbrush. If you feel your bristles are too stiff the American Dental Association (ADA) recommends changing to a “soft” brush. Soda isn’t just bad for our weight but also our teeth. And it’s not just because of the sugar (sorry diet fans). Carbonated drinks can be very bad for your teeth because they tend to be acidic and contain acids like phosphate and citric acid that weaken tooth enamel. As enamel wears away, bacteria forms on the teeth which leads to cavities. 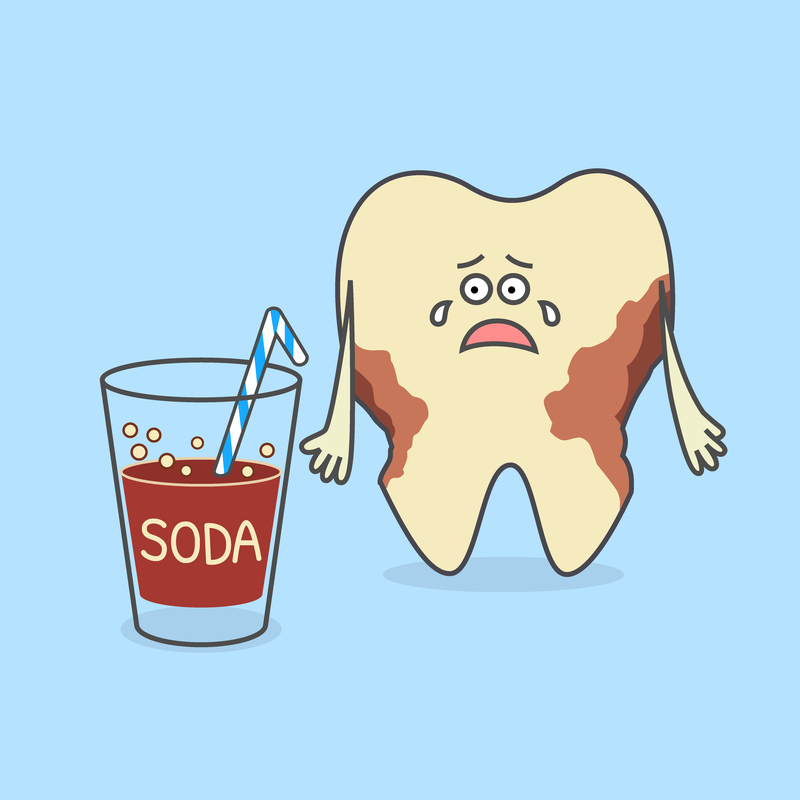 High sugary sodas pack a one-two punch; they break down enamel (your teeth’s first line of defense) and then penetrate the tooth, causing cavities. Not only will teeth be vulnerable for cavities but as you lose enamel your teeth are no longer as white, causing staining to occur. If you’re not ready to completely kick that 12 ounce can, drink your soda through a straw so it bypasses your teeth and gets right to the back of your mouth. Also, drink your soda quickly, constantly sipping keeps your mouth bathed in acids longer. When you’re finished rinse your mouth out with water, chew sugarless gum and if possible, brush. Our teeth are meant to chew a variety of different foods but one thing they are not designed to chew is our fingernails. While it may seem like a silly thing, it’s estimated that about half of all humans bite their nails. Half. Besides the fact that biting your nails is a disgusting habit (think of what may be trapped under your unwashed fingernails) and can lead to gross-looking fingernails there are several problems it can cause to your teeth. Biting your nails can lead to chipped teeth, diastama (a gap between your two front teeth), weakened roots, gingivitis and even loss of teeth. While these may seem like extreme cases and you may have been biting your nails for years and not had any visible issues, there’s never a better time bite the habit. We’re all guilty of crushing some ice with our teeth, whether out of an awkward habit or maybe because we love it so much (There are even pages on Facebook for Ice Lovers). Ice cubes may seem harmless and some might argue that they are beneficial, the American Dental Association advises people to cool it with the ice. Craving and chewing ice may even be a sign of iron deficiency anemia. 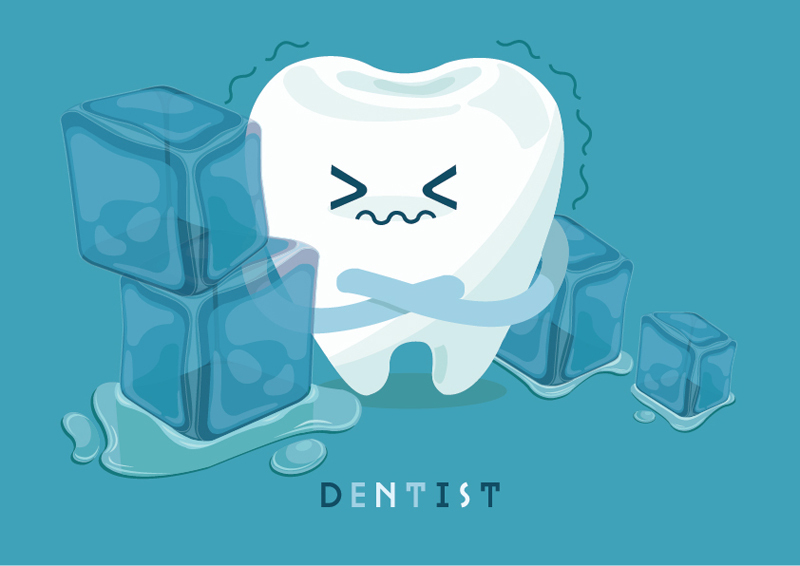 The cold temperature of the cube, mixed with the hardness is a perfect storm for cracking your teeth. If you need refreshment, dentists recommend letting ice melt in your mouth like candy. And if you still need that crunch fix, dentists recommend baby carrots or apple chunks. Need more convincing? Remember your blender requires special metal blades to crush ice…and those don’t even always do the trick. While there are many things that can cause damage to your teeth a safe rule is unless it’s food, it’s best to keep it out of your mouth. These five tips can save you physical pain, costly dental bills and protect your great smile.